On 14 Mar 2019, Moscow's State controlled news agency TASS reported that Russia is getting ready to launch the Zircon Hypersonic Missile from a naval vessel. The Missile will have a capability of flying at Mach 8 (9878.4 Km per hour) and will be simply "unstoppable" by any known missile defence system in the world. The News agency further reported that while the tests for the land-attack version of Zircon have been done five times starting Jun 2017, the tests for the sea-launched anti-ship version missile will begun by this year end. Further, it is expected that the weapon will go into production in 2021 and would enter Service by 20221. This article brings out some salient details about hypersonic weapons and analyses India's status in the hypersonic domain. Hypersonic weapons are the ones that can fly at speeds greater 5000 km/hr (more than 5 Mach). Such a speed is equivalent to about one mile (1.6 km) a second. These weapons fly low, remaining in the endo-atmospheric region (generally at altitudes below about 90 km), thereby reducing the chances of their detection by radar systems. For a rough comparison, commercial airliners fly at sub-sonic speeds whereas the modern fighter jets fly at the supersonic speeds of 2-3 Mach ( F 35 has a maximum speed of 1.6 Mach, while J 20 has a maximum speed of 2.5 Mach). The hypersonic weapons have such speeds that can allow them to strike anywhere on the earth in under an hour. Currently two versions of hypersonic weapons are being developed. These are Hypersonic Cruise Missiles (HCM) and Hypersonic Glide Vehicles (HGV). A conventional cruise missile is a guided missile used against terrestrial targets which remains in the atmosphere and flies the major portion of its flight path at constant speed. It can deliver a warhead with precision over long ranges. The Hypersonic Cruise Missile is a typical cruise missile which is ‘all the way powered’ to achieve hypersonic speeds of Mach 5 or higher. Talking of higher speeds, it is reported that the Russian Hypersonic cruise missile Kh-47 M2 is capable of reaching up to Mach 10 (12348 km/hr) and can carry a warhead to a range of 2000 km. Hypersonic Glide Vehicles (HGVs) are another version of hypersonic weapon range. Such a vehicle is also called a ‘wave-rider’ because it uses the shock waves generated by its own flight as a lifting surface to enhance the lift-to-drag ratio to reach the hypersonic regime of Mach 5 or even more. A typical HGV is launched by any solid propellant rocket/missile which can give it the initial boost and momentum up to a point after which the wave rider phenomenon can be sustained by the hypersonic vehicle on its own. What Makes Hypersonic Weapons so Lethal and Unstoppable? Hypersonic weapons owe their lethality and unstopability to several unique features These are enumerated in some details. In the context of speed, a combat vehicle flying at speeds of 5-10 Mach (amounting to 1 km per second or more) can simply overwhelm any conventional missile defence system in a manner that there is simply no time to carry out the battle essential functions of detection of the incoming missile, identification as to friend or foe (IFF), designation of the target to selected missile defences, bringing the defences to a state of operational readiness to fire and finally taking on the incoming threat. This reaction cycle of the defender, which is a few fleeting minutes and seconds gets totally beaten by the hypersonic warhead striking at a tremendous speed and prohibiting the defender to get his defences to react to such a threat in time. This is a huge advantage in the favour of hypersonic weapons since it holds the potential danger of making the entire spectrum of the current generation of missile defences redundant. The next combat virtue is undetectability which is the ability of such weapons to remain unseen by the adversary's sensors. This is achieved by the capability of such weapons to fly low. Take for instance a typical HCM. Not only, it is capable of flying faster than 5000 km/hr without losing manoeuvrability, but also, it can fly lower than the traditional ballistic missiles. By flying lower, the HCMs tend to avoid radar detection. Also, as stated, owing to their tremendous speed these do not let the ballistic missile defences to react and launch the counter in time. Boost and post-boost phase intercepts of hypersonic missiles are therefore remote possibilities which look nearly impossible at this point in time. Since speed (aided by also flying low level) becomes a combat virtue for making such weapons undetectable, and hence unstoppable, it is said, "speed is the new stealth". Another feature of strength associated with speed is the kinetic energy kill capability of hypersonic weapons. Experts opine that one kg of warhead carried by a hypersonic missile moving at Mach 6, has 36 times more kill capability than a conventional ballistic missile carrying the same warhead. To that end, even if a hypersonic weapon does not have a payload, the amount of kinetic energy released on impact makes such weapons extremely destructive2. Say for instance, if a hypersonic anti-ship missile hits a stern or a bow of a ship, it will go in through-and-through causing massive destruction. No wonder, the Chinese (in context of the ongoing South China Sea imbroglio) have recently asserted that their new HCM DF -17 can sink the US Navy aircraft Carrier3. How far is this claim technically sustainable is besides the point as sinking as massive a target as an aircraft carrier by DF-17 is appears to be a tall order. Precise targeting of the Carrier in the massive waters of the South China Sea will amount to finding a needle in the haystack. The next challenge will be to overcome the protective bubble over the Carrier? Be that as it may, the point regarding the tremendous kinetic destruction potential of hypersonic weapons cannot be negated. Another virtue of such weapons is unpredictability. In the case of traditional ballistic missiles, say in Inter-Continental Ballistic Missiles (ICBM), the payload is boosted all the way to the space, from where it follows a ballistic trajectory to its intended targets. In that, it re-enters the earth's atmosphere at a certain point and thereafter, either continues all by itself, or releases Multiple Independently Targetable Re-entry Vehicles (MIRV). Such trajectories right up to their intended end-game are very much predictable allowing the defenders to align their missile defences to destroy such targets. In the case of hypersonic trajectories, the payload which may be powered all-the-way as in the case of a HCM or boosted up to a point when the wave rider phenomenon takes place as in case of HGVs, all remain within the earth's atmosphere and more importantly, their trajectories being non-ballistic are highly unpredictable thus denying the defender the opportunity to align his missile defences to take on the threat. This phenomenon of unpredictability is highly pronounced in the case of HGVs. These small payloads gliding at speeds in excess of Mach 5 and more are so manoeuvrable that they can change their targets at any point. Because of this, HGVs can hold huge areas of the defender's domain at risk of strike, while making targeting of such payloads extremely difficult (if at all)4. Speed, The DNA of Hypersonic Weapons- How it is Achieved? If there is one feature which can be called the DNA of the hypersonic weapons, it is speed. The biggest challenge is to achieve this tremendous speed hovering in the bracket of 6-8 Mach. This is achieved through the use of Supersonic Combustion Ramjet (SCRAMJET) Engines. Typical jet engines are based on ramjet air breathing technology. Such engines when moved at high speed (for example as the aircraft moves for takeoff) use the high pressure in front of the engine to force the air through a tube where it is heated by combusting some of it with fuel. It is then passed through a nozzle to accelerate it to supersonic speeds. This acceleration gives the ramjet its forward thrust. The ramjets can produce speeds up to Mach 3 or Mach 4 due to the fact that the airflow in the engine's combustion chamber is to be decelerated to subsonic speeds. As stated, to enter the hypersonic bracket, SCRAMJET Engines have been designed. Such engines, though operate on the same principal of ramjet air breathing engines, these have the capability to support the combustion of supersonic air flows in their combustion Chambers. When such air flows are made to pass through escape nozzles they produce significantly higher acceleration, propelling the missiles at speeds that reach hypersonic ranges. A typical SCRAMJET and can reach the speed brackets of 5-15 Mach5. Nations which are in the forefront of development in the hypersonic weapons are China and Russia. In some aspects even ahead of USA. In fact an open source report dated 16 Oct 2018 states that US, as on date, does not have an operational hypersonic weapon but appears to have fast- tracked its development.6 Mr Patric Shanahan, the acting Defence Secretary of US, has recently remarked that the 2020 Pentagon Budget is shaped by the national security threats emanating from three words China, China and China7. Other countries in the hypersonic arms development race are France, UK, Turkey and India. Some developments in the field of hypersonic weapons in the nations at the forefront of such development is covered in some detail. China continues to move ahead very strongly in harnessing the hypersonic technology. Open sources reported in May 2018 that China has been testing the DF 17 - a ballistic missile combined with a HGV ever since Dec 2017. This weapon is reported to have been tested at least at two occasions. In one of the tests, the missile's payload flew to a range of approximately 1400 km before making a successful impact at a site in Xinjiang Province "within meters" of the intended target8. Beijing based military analyst Zhou Chenming reported in South China Morning Post that HGV technology has become a part of the nuclear strategy between world's three big nuclear powers. HGV warheads could be used with different type of ballistic missiles including ICBMs like DF 41. HGV warheads could also be used to destroy anti-missile systems. According to US intelligence estimates, DF 17 is expected to reach initial operating capability by around 2020 with the weapon capable of delivering both the conventional, as well as, the nuclear warhead. The aircraft was carried by a rocket which flew for 10 minutes (according it the boost momentum) before launching it. The launch took place from an undisclosed site in north western China. The aircraft then flew for about 10 minutes at speeds of 5.5 to 6 Mach (6738-7350 km/hr) achieving an altitude of 30 Km (remained endo-atmospheric). During the flight, the aircraft flew an unpredicted trajectory, made some large angle turning manoeuvres and landed in the targeted area as planned. The CAAA also tested a host of other cutting-edge technologies, such as a domestically developed heat-balance thermal protection system. Various parameters were met and the wave-rider prototype was fully recovered. Contrary to what was reported in some media reports, this was not the first time that a hypersonic vehicle has been put to test. The hypersonic era actually started way back in 1960s when the US started a ‘wave rider’ project to develop a B-70 deep-penetration strategic bomber named Valkyrie. This six-engine, delta-wing US hypersonic aircraft was designed to cruise at Mach 3+ at an altitude of 21,000 m above ground, meaning it was almost impossible to intercept the aircraft using aircraft or missiles. However, the ill-fated Valkyrie made a wobbly start and a string of accidents and shifts in the US-Soviet Union arms rivalry led to the programme’s cancellation. Valkyrie was grounded for good in the 1960s11. Taking into account the above, the credit still belongs to China for the first successful flight of a hypersonic missile in Dec 2017 and a hypersonic aircraft in Aug 2018. In Sep 2018 China conducted the tests of three ‘wide-speed-range–vehicles’ codenamed D18-1S, D-18-2S and D 18-3S respectively. All these three were scaled down hypersonic aircraft models of differently shaped designs whose speeds will be adjustable for a precision strike of an ‘unstoppable nuclear capable’ weapon. This was China's first hypersonic aircraft whose speed will be adjustable for a precision strike12. Prior to the current launch of Zircon (naval version) in Mar 2019, Russia reportedly carried out a successful launch of a liquid-fuelled ICBM on 26 Dec 2018, carrying the ‘Avangard HGV’ payload. The above payload was mounted on the Sarmat super heavy ICBM, RS-28. Avangard is capable of being carried as a MIRV payload and can deliver both the conventional, as well as, nuclear weapons. It was claimed that Avangard reached Mach 20(24,501 km/hr) and carried out sharp high speed evasive manoeuvres making it absolutely invulnerable to any missile defence system13,14 . The launch was performed by an operational unit of the Strategic Missile Forces. The payload was aimed to hit a hypothetical target at the Kura range. Flying at hypersonic speed, the glide vehicle performed vertical and horizontal manoeuvres and hit the hypothetical target in time within the range's combat field15. Avangard is believed to be a high technology HGV which is capable of carrying nuclear warheads to any part of the world. Experts have opined that even without the warhead, its sheer speed of Mach 20 gives it the force to obliterate any target. The US intelligence analysts have warned that the West has no defence against such type of HGVs which are capable of carrying nuclear weapons. Apart from the Avangard HGV and other weapons as stated above, Russia is also reported to have an air launched ballistic missile Kh-47M2 Kinzal (Dagger) which is capable of operating at the supersonic speed of Mach 10 and can carry both the conventional, as well as, the nuclear warheads to a range more than 2000 km. Currently, except for an unproven ground Based Interceptor ( GBI) system that is being developed at a vast expense in the USA, there is currently no capability to intercept even standard ICBMs except a counter strike in the mutually assured destruction mode. In Aug 2018, the US Air Force awarded M/s Lockheed Martin a $480 million contract to develop a second hypersonic weapon prototype - The Air launched Rapid Response Weapon (ARRW) following a previous separate contract in Apr 2018 wherein the company was selected to design a prototype for the Hypersonic Conventional Strike Weapon or ‘Hacksaw’. While the popular opinion is that the US is lagging behind China and Russia in the hypersonic Arms race, the counter-opinion has it that US is not behind, in fact, it is ahead in the race. It is stated that US is following a different end point, wherein, in contrast to the rivals, who are focussing on the hypersonic weapons for the delivery of nuclear weapons, US is developing hypersonic weapons for the delivery of non-nuclear conventional warheads. Such weapons need to be much more precise and pose a higher technological challenge17. As regards the boost glide weapon technology , the US has claimed that its Advanced Hypersonic Weapon Research has tested HGVs over 4000 Km range dwarfing the HGV vehicle range of less than 2000 km by China18. $139.4 million for Air Force and DARPA collaboration on rocket propelled hypersonics. The operational prototype of the product, Tactical Boost Glide (TBG) vehicle is likely to be ready by 202319. $14.3 million for Air Force work on Jet propelled hypersonics. Product - Hypersonic Air Breathing Weapon Concept (HAWC). $ 53 million for Advanced Full Range Engine (AFRE) for future hypersonic vehicles. While the real threat from hypersonic weapons is still some distance away, the air-defenders are already active in trying to think through this ‘impossible looking’ threat in a bid to shape a possible counter. Such is the feverish pace of the cause-effect cycle eternally at play between the prosecutors of the air threat and air-defenders. For a threat which is just about shaping up, the attempts to build the counter hypersonics are in their R&D phase at best. The US’ Defence Advanced Research Projects Agency (DARPA) is trying to research possible weapon options (called glide breakers) which could take on this futuristic threat. Weapons that could be based on space with soft kill magazines firing at the speed of light etc are being researched as possible options. The target to be destroyed surely poses huge challenges - speeds in the region of Mach 20, unpredictable non-ballistic trajectory, high manoeuvrability, unpredictability of flight, low endo-atmospheric operation avoiding radar detection and more. If hitting the ICBMs amounted to hitting a ‘bullet with a bullet’ what it will take to kill an HGV (if at all), can be vaguely imagined. Still early days indeed. Where is India in the Hypersonic Field? As far as the technological threshold and the issue of entering the hypersonic domain is concerned, India has reportedly crossed the entry barrier. As per open source information of Feb 2018, the Defence Research and Development Organisation (DRDO) has developed a surface-to-surface tactical missile codenamed ‘Shaurya’ which has a hypersonic speed of 7.5 Mach (9187.8 km/hr) and a range of 700 m. This missile is capable of carrying a payload of one ton which could either be conventional or nuclear. The missile is designed to fired from submarine. After reaching a height of 50 km, the missile starts flying like a HCM. Once it reaches the target area it manoeuvres towards the target before striking with an accuracy of 20-30 m within the target area21. Another missile that is making news is the BrahMos II Hypersonic Cruise Missile under joint development by DRDO and Russia's NPO Maschinostroyenia, in a highly successful Joint Venture ( JV), BrahMos Aerospace Private Limited ( BAPL). BrahMos II is an upgraded version of BrahMos I which is a supersonic missile (speed 2.8-3.0 Mach, range 290 km). In fact, in the journey of transiting from BrahMos I to BrahMos II, another cruise missile was developed called the BrahMos ER where ER stands for extended range. This happened post 2016 when India joined the Missile Technology Control Regime (MTCR) and the restriction to develop/import any missiles greater than a range of 300 km remained no more valid. Consequently, BrahMos ER has a range of 450-600 km. BrahMos II will have a speed of about Mach 7 (8775 km/h) and a range of 600 km. This missile is currently under development will be ready for testing in 2020. It is likely to achieve operational status by 2022. Some experts have linked Zircon Hypersonic Missile BraMos II. The missile when developed will be capable of being launched from land, sea, submarine and air medium. Even the interceptors in the indigenous Ballistic Missile Defence (BMD) Programme of DRDO are supposed to be in the hypersonic domain (status details not covered being classified). As regards the HGVs, the same is still in the conceptual stage, world over. In that, it is essential to state here that this concept must be kept alive as a future niche technology area and R&D directed towards it as deemed operationally necessary at a point in time. No matter, if the hypersonic threat itself, has not matured as yet on our borders, it is operationally prudent to keep the issue of counter hypersonics alive in concept. In that it is relevant to flag the challenges and imperatives that go into putting up a viable hypersonic defence, many years from now. These are briefly enumerated. The first challenge to be confronted is the detection of hypersonic weapons. Towards this, the national level air defence Battle Management Command and Control (BMC2) system, i.e Integrated Air Command and Control System (IAACS) of the Indian Air Force with linkages with similar systems across the three Services and with civil aviation, needs to further grow in the years ahead into futuristic sensor capabilities based on satellite surveillance to be able to detect hypersonic class threat vehicles. It is reiterated, this is a huge challenge and a very tall order which is many many years into the future. Keeping in mind the combat virtues of speed and manoeuvrability of hypersonic weapons, no conventional solution of hard kill is going to succeed. The answer will lie in instantaneous soft kill. To move in this direction, indigenous efforts currently in progress for development of laser-based soft kill capability needs to be speeded up. The current challenges being faced (not described being classified) needs to be addressed through international cooperation if need be, taking the route of joint ventures under make-in-India initiative. This capability, once operationalized, will have to be co-ordinated with the requisite sensor capability as and when the same gets realised. This will require years of effort involving multi-platform and multi-agency coordination. While laser based soft kill weapons are closer to realisation, another promising area to take on such weapons is on the route of electromagnetic debilitation. This could be another niche research area. That said, the research in other possible fields of soft kill weapons, like the charged particle lightning bolts or the material disintegrating capabilities of high power microwaves need also to be kept alive at the pace where the world is going. What defines any threat are three factors, namely immediacy, priority and lethality, i.e in what time frame the threat will become live, what will be the inter-se priority of this threat with respect to other threats at the time it becomes live and how lethal will it be (implying what will be required to counter that) are the key deciders for shaping a response. What is the quantum of such a threat? Test flights notwithstanding, in what time frame from now on, such a threat can actually get operationalised? The probability of such a threat actually getting unfolded on our borders. Speaking in respect of the above three points, it can be stated that in the foreseeable future, the quantum of such threat vehicles are likely to be very limited and still far in the foreseeable future. Also, it is felt that such vehicles are more weighed as tools of deterrence rather than instant battlefield ready weaponry. For hypersonic capability, China has better mileage elsewhere (not discussed). All the above notwithstanding, the bottom line of remaining, aware, informed and alert cannot be over-emphasised. Such is the neo-evolving domain of hypersonic weapons which actually defines the cutting edge today. The good news is India is very much in the play in this emerging landscape. "Russia likely to launch Zircon hypersonic rocket from a warship by year end", at www.defenseworld.net. Accessed on 15 Mar 2019. 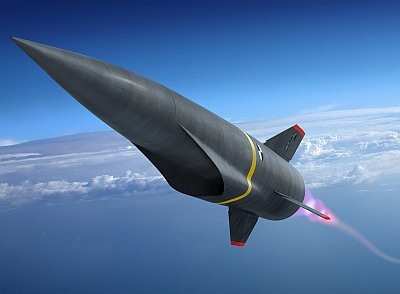 "Hypersonic Weapons; Can anyone stop them?," at www.airforce-technology.com. Accessed on 15 Mar 2019. "China says its Hypersonic Missile can sink American aircraft Carriers," at www.thepopularmechanics.com. Accessed on 15 Mar 2019. "Cruise Missiles", at www.en.wikipedia.org. Accessed on 15 Mar 2019. "Scramjet engine technology," at wwwisro.gov.in. Accessed on 15 Mar 2019. "Chinese Bombers and Hypersonic Missiles mean US Military money has a new target," at www.nzherald.co.nz. Accesses on 17 Mar 2019.
https://economictimes.indiatimes.com>hgv:china's -advanced-hypersonic-missile-threat -to-India. Accessed on 17 Mar 2019.
https://www. indiatoday.in>world's-first-hypersonic-aircraft-that-can-fire-nuclear-warheads-successfully-test-fired-by -China. Accessed on 17 Mar 2019.
https://www. http://www.atimes.com/article/china-tests-its-hypersonic-wave-rider-aircraft. Accessed on 17 Mar 2019. "China tests three hypersonic missiles at one go," at www. economictimes.indiatimes.com. Accessed on 17 Mar 2019.
https://www.dailymail.co.uk>what-is-russia's-avangard-hypersonic-glide-vehicle. Accessed on 17 Mar 2019.
https://www.en.wikipedia.org>avangard-hypersonic-vehicle. Accessed on 17Mar 2019. "Russia Conducts Successful Flight Test of Avangard Hypersonic Glide Vehicle," at www.thediplomat.com. Accessed on 17Mar 2019. "Mach 5 Arms Race: Us Military is Racing to Build Hypersonic Weapons", at www.nationalinterest.org. Accessed on 17 Mar 2019. "Hypersonic Arms Race: US may not be losing to China or Russia:, at www.cnbc.com. Accessed on 19Mar 2019. "US more than doubles hypersonic missile budget to catch up to Russian Mach 10 missile, " at www.nextbigfuture.com. Accessed on 19 Mar 2019. "DARPA is looking for a Way to shoot down Hypersonic Weapons", at www.nationalinterest.org. Accessed on 19 Mar 2019. "Shaurya (missile), " at www.en.wikipedia.org-wiki>shaurya. Accessed on 19 Mar 2019.